I’ve had seven wonderful filles au pair work for us since my twin daughters were born nearly five years ago. All French, and very deliberately so. At the time they were an absolute necessity and most certainly saved me from checking myself into a sleep clinic! On reflection, almost a year since we’ve had any live-in help, those girls were not just a convenient way for me to keep up my French and have the kids immersed in it, but that time with them living in our home and eating our meals really shaped my curiosity about French food and culture. Nearly all of them, very politely, turned up their nose to our Australian bread – and rightly so. I now know that some of the flour produced in Australia, by comparison, is absolute rubbish. I’ve always been someone who loves her bread and pastries … but I had to really limit it because I suffered bloating as a result. Sound familiar? There’s no denying us Australians are amidst a “gluten-intolerant” epidemic. So why is this so common in my generation? Twenty years ago it was barely heard of. About eighteen months ago on my quest for answers to my twin daughters’ constant tummy troubles, I came across a naturopath whose wife is gluten intolerant. He shared with me that when they traveled through France, she found she could eat bread without any nasty side effects. He now sells French flour through his clinic and since that day it’s all you’ll find in my pantry. My passion for this product has led me to have many conversations (in French and English!) with anyone who knows anything about French flour. I’ve tracked down bakers in Brisbane and as far as Perth who use the flour, and I’ve scoured pages of the internet in search of more information about the quality of French flour. I really feel like it’s important to be educated about the food we eat and hopefully once you’ve finished reading this article, you’ll not only be keen to try your own homemade bread using French flour, but you’ll be much more aware of Australian wheat and flour practices. There are three main points to cover in understanding the differences … how the wheat is grown, how it’s processed and how the bread is made. There are several factors that come into play when you start asking about how wheat varieties are grown in this country – our weather conditions are drastically different to France and the nutrients in the soil are far richer in France due to common practice of complementary planting. This means that crops are rotated so as not to deplete the soil of the same nutrients every time a crop is harvested. I visited a regional area of the South of France earlier this year and noted that my backyard was a rye field but that six months before that I would have looked out my bedroom window to a crop of sunflowers. In my opinion, the most significant difference is how Australians “over-process” wheat. In our supermarkets, we find our basic plain flour and self-raising flour as almost our only options. Self-raising is only so because of the additives and it doesn’t even exist in France. I’m still learning about this, but for some reason, Australian mills take out some really crucial enzymes that exist in a certain part of the wheat head that enables our bodies to digest the gluten more effectively. The French leave these all in the product and as a result, they produce breads that are naturally lower in gluten as a percentage but that still provide all the enzymes nature intended us to have to aid in digestion. Makes sense right? I suspect it must cost far less to mill the way us Aussies do. 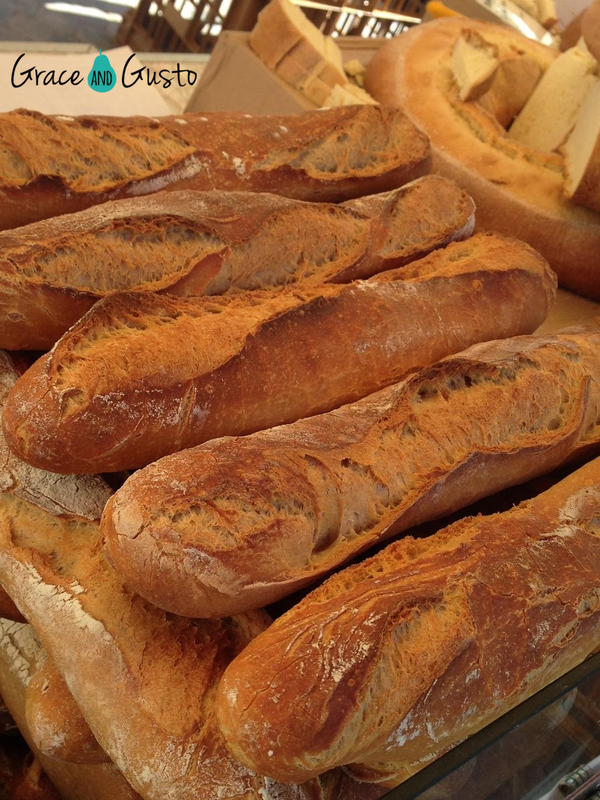 There are over six types of flour that are used daily in French boulangeries. Traditional baguettes use T55 or T65. T45 or T80 will be used for pastries, cakes or brioche (you may also be familiar with the Italian type 00 flour which is similar). T130 is a rye, T150 is similar to what we know as whole wheat and T110 is a flour that offers colouring half way between white and brown. These numbers refer to the ash content per 10mg of flour. The gluten content as a percentage is lower (9-11%) in the softer wheats (T45) and higher (11-13%) in the harder wheats (particularly wheat harvested in Spring) like T65. For me, all these confusing numbers come down to one thing: I buy T55 flour from Basic Ingredients to make my family’s bread four times a week. It takes me two minutes to prepare, I leave it for an hour to prove and I cook it for 40 minutes. I do two loaves at a time and freeze what we’re not eating straight away. And the bottom line is that we have noticed drastic changes in our tummy health throughout the family. It tastes better, costs no more than spelt flour, my house smells amazing and the kids notice the difference when they eat commercial bread elsewhere. My next test was to ask a friend who is highly gluten-intolerant to try the bread. I really had to twist her arm. She had avoided gluten for years and was not excited about the possibility of gut ache again. I am very excited to tell you that she too now buys the flour to bake her own bread and she can once again enjoy a wheat product without the angst of side effects. France Gourmet imports the flour into Australia, and there are French-trained artisan bakers in Australia who won’t use anything else. Rob Howard of Harvest Boulangerie in Perth, is one such boulanger. He was on the Australian Baking Team with Brett Noy in 2010 (Italy) and 2011 (China) and came third both times in the Coup du Monde. Pretty impressive considering the tough European competition. He explained to me that most bakers will use 1-2% yeast and often a bread improver to oxidise the dough. This is a chemical additive to speed up the process and sell bread faster. He prefers to engage in long, slow fermentation stages using no chemicals at all – just salt. This is what he was taught in Paris. Fermentation is a natural process that breaks down the starches and even the gluten to a point, and this can take up to twenty-four hours. The results speaks for itself: Rob sells between sixty and eighty baguettes a day in his Scarborough bakery. He also highlights that the flour industry in Australia is not regulated the way it used to be. Wholemeal flours for example used to require a minimum of 90% whole wheat but these days, no one checks! It’s pretty easy to see why there are myriad reasons why our tummies are suffering at the hand of inferior flour produced in Australia. In Brisbane, Sebastien Pisasale of Crust and Co Artisan Baking, uses a mixture of Australian and French wheat for consistency. And what he says is so true – unless the customer demands a superior product, it’s just not commercially viable for bakers to import all their flours. So once again folks, it’s up to us to take responsibility for our own health, get educated and seek better options. I’m going to go and live in the country that produces healthier, tastier breads, but if that option is a little drastic for you, I really encourage you to try making the bread yourself using French flour. I have no commercial ties to Basic Ingredients (wish I did!) but so far it’s the only retailer I have found who supplies it in small enough quantities for household use (I buy 5kg bags at a time). Give it a try, your tummy – and taste buds – will thank you! This quantity will make 2 baguettes or 1 loaf of bread. I use the Thermomix to knead the bread, but you could use a bread maker, KitchenAid or get some exercise and use those arms! Mix your warm water with the yeast, salt and olive oil. Add the flour and combine on speed 6 for 8 seconds. Knead on interval speed for two minutes. Rest on a bread mat in a warm spot for at least 30 minutes. I have left dough for up to 24 hours to encourage further fermentation. Just depends how much time you have before the kids demand toast for breaky. Shape the dough into baguettes or a free form loaf (or you can even place in a large loaf tin) and bake on a large baking tray lined with baking paper. Mark the top of your bread with a sharp knife as per the picture below. Spray the top with water for a golden crust. You may wish to repeat this half way through the cooking time. Place in a cold oven and cook at 220 degrees for 30 minutes. Check the crust is hard and golden. Depending on the size of your loaf, it may need an extra 5 or 10 minutes. If you’ve baked it in a tin, I recommend removing it from the tin and baking for a final 5 minutes out of it’s tin. Now if you’ve made two like I do, allow one to cool completely, slice and freeze in a plastic bag. The other loaf must be tested whilst still warm with lashings of butter! Categories: Food | Tags: artisan, baking, basic ingredients, flour, Food, foodie, France, gluten, graceandgusto, graceandgustofood, thermomix | Permalink. Once again, my kids taught me a lesson this week! They showed commitment, persistence and determination beyond their years and I am suitably proud of their efforts (they did get a great deal of help from their marketing-savvy father I must admit). It started a few weeks ago when one of the twins and her brother announced that they would like to start a business. Baring in mind they are four and a half and six years old, we were surprised to hear them so keen. Granted, they are growing up in a household where business is the norm, but we’ve never spoken directly to them about our businesses or the fact that they should consider this in the future. They really are sponges! Eventually we settled on selling brownies on the sidewalk. We’re just off a fairly busy road so we had a captive audience. The short story is that we’ve had two sales that went extremely well. The first was on a Sunday afternoon and we sold out in twenty minutes. As the kids’ supplier, I was expected to double the quantity for Thursday afternoon and we almost caused a traffic hazard when an ambulance pulled over! A sell-out once again. One lady asked for our next sale date so she could Facebook it! The lessons for the kids covered maths, advertising, organisation, teamwork, food safety, people skills and customer service, banking and restraint! Needless to say I have perfected my organic brownies down to the last detail. I had requests for the recipe – so here it is. I used the Thermomix, of course, but it would be fairly easy to do this in a regular food processor or just by hand. You can of course substitute the ingredients for non-organic options but the reason these taste so good it that I always use the best available ingredients – it makes a huge difference. The customers are happy too! Preheat oven to 160 degrees and completely line a 20cm x 5cm deep slice tray. Ensure you use enough baking paper that it comes up the sides and slightly over – this will help you easily remove the brownie slab from the pan when cool. Mill the raw sugar on speed 9 for 5 seconds. Add the baking powder, flour and raw cacao. Mix on speed 10 for 5 seconds. Set aside in a bowl. Add the dark chocolate, broken down into 2-square pieces and roughly chop for 4 seconds on speed 5. If you’re chopping by hand, don’t be afraid to have big chunks left in the mix – these are the best bits once cooked! Set aside in another bowl. Melt the butter for 3 minutes on speed 2 at 60 degrees with the sea salt. Allow to cool to 37 degrees before continuing. To speed this up, remove the TM bowl and set on the bench to cool quicker. Add the flour/cacao mix to the TM bowl, followed by the 4 eggs and the vanilla extract. Mix for 30 seconds on speed 3. Scrape down the sides of the bowl and continue for another 5 seconds. Add the chopped chocolate and mix on reverse speed 3 for 10 seconds or until combined. You may need to finish by hand. Pour the mix into the tray and smooth with a spatula. Cook for 1 hour or until completely set. This takes a little intuition … the middle pieces will always be a little moister than the outside pieces and this provides good variety! Some like it super gooey and others like it chewier so you can cater for all tastes. The worst mistake is to overcook the brownie slab … don’t go over 1 hour 10 mins or it will be overcooked. Leave to cool completely in the tin (overnight is best) before removing (use the paper sides to pull up and out evenly so as not to break the slab). Cut into 6 large or 8 smaller pieces. N.B. For best results, I double the mixture (made in 2 batches though) and use a 34cm tin that is 5cm deep. I smooth the first batch and pour the second on top and smooth again. I cook for exactly 1 hour 7 mins (yes I must be superstitious!) and it works beautifully. Makes 12 large pieces. Keep in an airtight container in the fridge but for best results, return to room temperature before serving. Dust with icing sugar. Serve with fresh raspberries and double cream. Categories: Food | Tags: brownies, chocolate, dark chocolate, dessert, french flour, raw cacao, sweets | Permalink. I’m quite chuffed about this recipe … the brilliant Jo Whitton has done it again with her Quirky Cooking Thermomix cookbook. I’ve made it a few times now with different versions and I’ve settled on cranberries as a quick and easy substitute for dried sour cherries. I don’t know about you but I don’t stock these in my pantry very often. So this is a sugar-free fudge that honestly is prepared in 5 minutes and only takes an hour to set in the fridge – no baking or overnight chilling required. It’s ingenious in it’s simplicity and allows lots of flexibility to change up the dried fruit (or nuts – I’m thinking pistachios for Christmas time!) to suit your family’s taste. In this batch, I did half dried cranberries and half goji berries for added nutrition. You could substitute these for sultanas, chia seeds, currants, pepitas, sunflower seeds, cacao nibs or nuts if you’re keeping them at home. Yum!! You will need a Thermomix or a good quality food processor. Put the desiccated coconut into the food processor or TM and blend until a paste forms (in the TM this is about 1-2 mins at speed 8). Scrape down the sides with a spatula and add the coconut oil … pulverise for 1 min on speed 8. It should be quite liquid now. Add the dried fruit, vanilla and maple syrup and mix on reverse speed 3 for 10 seconds. If you don’t have a Thermomix, just stir it together in a bowl. It will come together as a crumbly solid. Pour mixture into a lined 20-25cm slice tin and smooth with a spatula. Score into small squares – it makes cutting it later a lot easier. Refrigerate for an hour before cutting and serving. Lovely as an after-dinner snack with green tea. Would love to hear what other versions you come up with! Categories: Family, Food | Tags: coconut, desiccated coconut, healthy snacks, kids treats, lunchbox | Permalink. Here’s another winner with the kids … I tested them in the lunchbox today and by the look of my daughter’s chocolate-smeared grin when I picked her up from kindy this afternoon, these get the kid tick of approval! I find it so helpful to bake up a double mixture of these and stock the freezer – it makes that morning rush so much easier and you look like a pro if anyone “drops in” for morning tea. Use really good quality dark chocolate (at least 70%) to maximise nutrition and you could even hide some chia seeds or maca powder in these without affecting the taste. Preheat the oven to 180 degrees fan forced. Line your muffin trays with paper cases. If you’re using a Thermomix, mix your bananas, eggs, oil and vanilla on speed 5 for 5 seconds to combine. Non-thermomix users – mash your banana and stir in all other wet ingredients to combine. Add remaining dry ingredients, reserving a third of the grated chocolate, and combine at speed 3, reverse for 10 seconds. Use your arm muscles and a spoon if you don’t have a TM. Spoon the mixture into the paper cases, half filling them and finish by sprinkling the dark chocolate over the top. Bake for 30 minutes and cool on a wire rack. Eat fresh or freeze for lunchboxes. Categories: Food | Tags: banana, dark chocolate, graceandgusto, graceandgustofood, healthy snacks, kids treats, lunchbox, morning tea, muffins, treats | Permalink. My kids love their nuts and it’s a challenge to find nut free choices to pack in the lunchbox … but the rules are there for good reason, so I played around with a new slice recipe to keep the kids interested. Hope this goes down well in your household too! Melt the butter and honey together on low heat. If you’re using a Thermomix, melt for 2 minutes at 60 degrees, speed 2. Add all the dry ingredients and stir to combine. In the TM, use reverse for 30 seconds on speed 3. Transfer to a slice tray and bake for 20 minutes at 180 degrees or until golden. Allow to cool and cut into muesli bar or slice shapes. Best to store in the freezer and in hindsight I would have doubled the mixture as they disappeared too quickly! You can easily substitute the berries for sultanas or seeds, the quinoa flakes for oats and the coconut sugar for rapadura or raw sugar if you prefer. Categories: Food | Tags: graceandgusto, graceandgustofood, healthy snacks, kids treats, lunchbox, nut free | Permalink. Food … the great connector! I learnt a valuable lesson today that I felt compelled to share with you. Contrary to my most frequent conversation topic, I have decided that sometimes … it’s not about the food. It’s actually more about the conversation. We’ve all heard that it’s not about the bike … it’s the challenge. It’s also not about the outfit … it’s your presence. It’s not about the hair or make up … it’s just about you being there. I am preparing for a dinner party tomorrow night for ten people … it’s something I really love to do. I love spending time in the lead up planning what I’ll serve and balancing the menu so it flows well. I think about the atmosphere, the music, how well my guests will connect with one another. I consider my timing of the night to make sure no one is ever hungry or thirsty … but also not so full that they can’t manage dessert. It’s all the thinking and creative design that goes into a night that I really love. But I stopped myself this week and realised I got so caught up in how complicated a dish was getting that it meant I would miss conversation at the table and time lingering over a glass of wine with friends. Something I love to do is bring homemade goodies to share with girlfriends when we get together. I was on my way to one such meeting this morning and I was cursing that I hadn’t had time to prepare something to take. And almost as soon as I walked in the door, it hit me that I just needed to turn up – that is was more important to someone else this morning that I just be there – with or without food to share. I’m so glad I shook the disappointment off quick enough to notice the look in a friend’s eyes that told me she didn’t give two hoots about a piece of cake … she just needed someone to be there for her and to listen. Food would have been a distraction and I would have missed a huge opportunity to make a difference. Earlier in the week I took a surprise birthday cake for a friend to a get together. Again – I spent way too much mental anguish over the fact that I had bought a cake and not made one. We’d all eaten dessert by the time the cake came out so once again, the type of cake was irrelevant – the most important thing was that the cake was more like a handwritten note that said “I know it’s your birthday, I care about you, and you deserve to be spoilt”. That’s what really mattered. So although us foodies do talk about, think about and create food A LOT, I’m here to say that I don’t take for granted the people I get to share it with. They’re more important than the food … what’s a dinner party without guests? 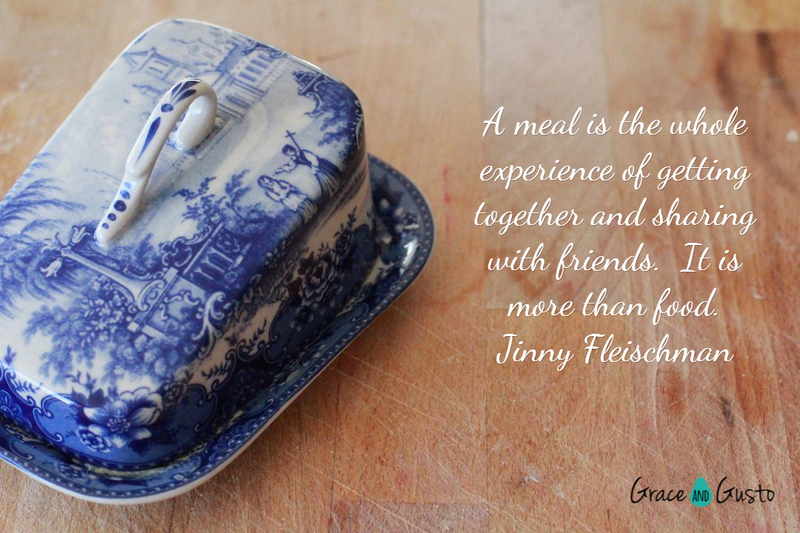 Categories: Food | Tags: dinner party, graceandgusto, graceandgustofood, grateful, lunchbox | Permalink. Glorious sunshine we are having … but for some reason when the sun goes down, I am looking for a sweet treat to finish off my busy day. I am always in pursuit of ideas that are nutritious whilst still being yummy, and I think this one will delight! I served this at a recent morning tea and apart from working hard to keep them from being eaten before I left the house, they were well received at the event. I’m surprised by how little is known about medjool dates. Dates are an ancient fruit originating from Northern Africa and the Middle East and Medjool dates in particular are prized for their larger size and juicier flesh. They’re a good source of fibre, potassium, magnesium and manganese. They still do contain a reasonable amount of fruit sugar but they’re a good alternative to other desserts or treats. No recipe required for this one! Simply cut your dates length ways (don’t cut right through) to remove the seed, then cut your cream cheese block into small rectangles and squash it between the two halves like a hot dog. 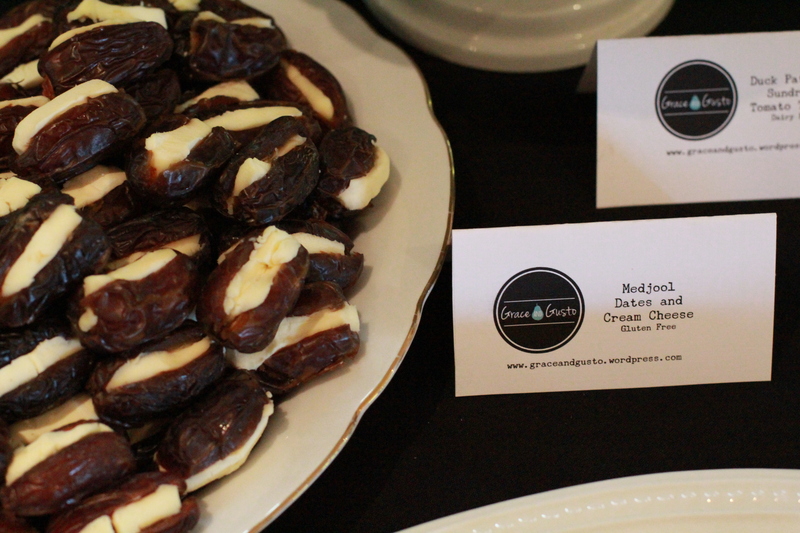 One block of cream cheese will be sufficient for about 50 dates. They can be made the day before and kept in the fridge. They present beautifully and the taste combination is spot on … enjoy! Categories: Food | Tags: dates, graceandgusto, graceandgustofood, kids treats, snacks | Permalink.